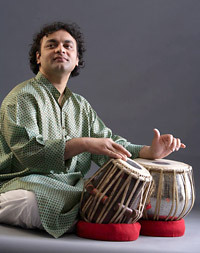 Aneesh Pradhan had a liberal and encouraging familial upbringing, which was coupled with an intensive period of study under the illustrious tabla maestro Nikhil Ghosh. His training with this veritable repository of traditional compositions from the Delhi, Ajrada, Lucknow, Farukhabad and Punjab schools of tabla playing enabled Aneesh to widen his horizons. His participation in Indian music recitals and in cross-cultural musical collaborations have taken him on extensive tours within India and overseas. His first solo album distributed by Underscore Records reaches listeners among a host of others, which feature him as accompanist on national and international record labels. Broadcasting and television networks have also recorded him. Aneesh continues to enrich his musical persona in his capacity as composer to film, theatre and dance projects. He won the Natyadarpan ‘Best Background Score’ Award for 1998, for his music to the Marathi play ‘Tumbara’ directed by Sunil Shanbag. Inspirational virtuosi Adrian McNeil (sarod) and Bobby Singh (tabla) form the most respected, experienced and talented North Indian music ensemble in Australia. Now calling Sydney home, both players have studied traditional methods under masters of their respective instruments in India. 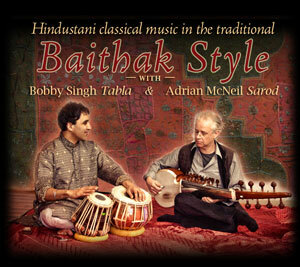 As soloists and as a duo, they continue to receive critical acclaim throughout Australia and India and around the world. This Febuary they will be performing in India for the first time as a duo!! And bringing their unique sound that they have been cultivating in Australia for the past 20 years for your listening pleasure. This will be a rare chance to hear these two musicians together in performance and also selected master classes where you will get an insight in to the complexities of working in cross cultural ensembles in Australia.